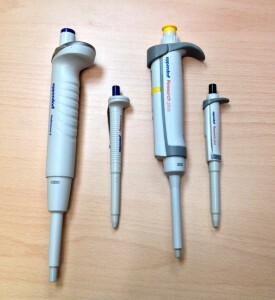 Micropipettes are a commonly used in laboratories to aspire and dispense liquid, usually down to 0.1 uL. They’re an essential part of the laboratory and if you work in a lab its very likely that you’ll have to use one. Whether you’ve never used one or you’ve utilized one for years, its always good to to refine your skills. Not only is a micropipette a crucial part of the lab, it is also an expensive one. Be sure to take care of it and have it calibrated at least once a year. To help you use a micropipette, we’ve compiled a set of resources to help you improve your pipetting skills. It might seem like common sense, but do not aspirate liquid into a pipette without a pipette tip attached. This will not only ruin your results but inevitably damage the interior of the pipette. That means having the pipette calibrated and repaired, costing you extra time and money. Using a pipette past its volume limit will give you inaccurate results and possibly damage the pipette. It’s not worth pushing the micropipette past its limits to save time. Switch to an appropriate pipette that will allow you to work with the volumes you desire. Lab technicians that have jammed the pipette tip into the pipette have said they do it because it needs to be attached more securely. That is the indicator. If you continuously do this, do not continue to jam the pipette tip, it will break the shaft and cost you repair fees. To add to the list, don’t forget to pre-wet the pipette tip 2-3 times before using aspiring a sample. This will increase the humidity within the pipette tip and minimizing sample evaporation. Remember to check our Proper Pipetting Resources article for advice by major manufacturers on how to properly pipette. 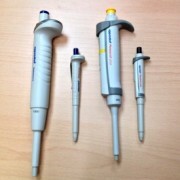 If you have any questions regarding how to use a micropipette, contact Pipette.com at 800-243-3232 or info[at]pipette.com.